The Internal Revenue Service (IRS) requires you to pay federal income tax on all your income in a given year. Generally, most people complete their income tax return based on their income from a W-2. However, if you receive a 1099 to document your income, you may be responsible for paying federal income tax and self-employment tax. If you are an independent contractor, you may receive several 1099s, and if you earned interest from a bank account, your bank will also send you a 1099 to document that income. Collect all your 1099s from your employers. Currently IRS rules stipulate that all income earned throughout the year is liable for federal income tax. To avoid misreporting penalties, ensure you count all your income. Complete IRS form 1040. 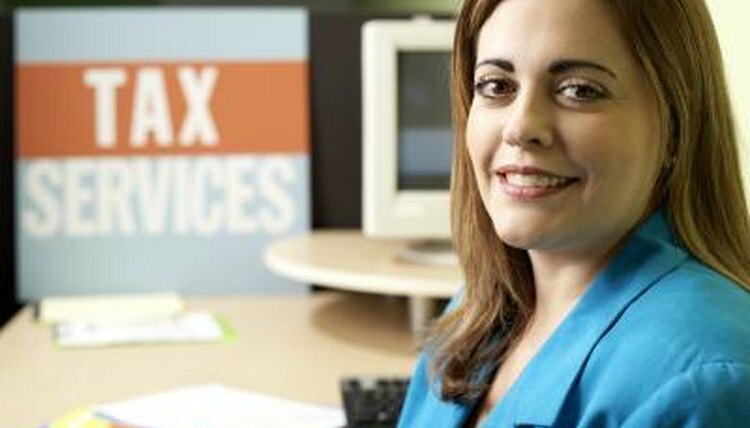 Depending on your situation, you may have to file a 1040A or 1040EZ. Ensure that you fill out your personal information accurately to avoid delays in collecting your income tax return. Go over your 1040 carefully to double check that you have taken all the appropriate credits to reduce your taxable income. If you don't itemize, you may claim basic credits and deductions for paying student loan interest, standard deductions and exemptions, IRA contributions and other pension plan contributions. Calculate your federal income tax liability. Your federal income tax liability is based on the amount of taxable income you have after taking all your appropriate deductions and credits. The less taxable income you have after deductions, the less income tax you will pay. Calculate your Social Security tax. The IRS currently collects Social Security tax from people with 1099s through a self-employment tax. You are liable for self-employment tax if you made more than $400 in self-employment income, or more than $108.28 if you are a church employee. At the time of publication, the tax rate for self-employed income is 12.4 percent for Social Security and 2.9 percent for Medicare. Use schedule SE for form 1040 to figure the exact amount of Social Security and Medicare tax from the income on your 1099. File your federal income tax return by the April 15 deadline. Once you have filled out your 1040 and Schedule SE, file your return through the e-file system for faster processing. You can send your return to the IRS through the mail. Look at the last page of the 1040 instruction booklet to find the address of the regional IRS office authorized to process your return. Fuentes, Gilberto. "How to Calculate Federal Taxes & Social Security from a 1099." , https://legalbeagle.com/5928427-calculate-taxes-social-security-1099.html. Accessed 22 April 2019.